The purpose of the Indiana News Photographers Association Photographer of the Year contest is to promote excellence in news photography; to persuade the general public that news photographers are instrumental and important in the reporting of news and the recording of daily life in their communities; to teach beginning photographers about photojournalism; and to help working news photographers improve their photo-reporting abilities. INPA members in good standing are eligible to enter the contest. A member in good standing is a photojournalist who has paid his or her dues, lives in Indiana or works for an Indiana-based news organization and adheres the principles outlined in the NPPA Code of Ethics. If a member was in good standing during the calendar year preceding the contest entry deadline date ([cgv poyyear]) but have since moved, he or she may enter by paying a contest entry fee equal to annual dues, currently $35. This is good for entry into the Photographer of the Year and Multimedia contests only. Photographs taken between January 1 and December 31 of the year preceding the contest entry date ([cgv poyyear]) are eligible for entry in the contest. Photographs in a picture story entry taken over a period of time before the period of eligibility (January 1 – December 31, [cgv poyyear]) may be entered as long as they have not been entered in the contest in any category before or been published prior to January 1, [cgv poyyear]. An entrant may submit a maximum of 30 entries. Each picture story is counted as one entry. Entries for Photographer of the Year Portfolio (poy), The John Ahlhauser Award (jaa), Sports Photographer of the Year Portfolio (spp) and Community Awareness Portfolio (caa) do not count toward the 30 entries limit. Photographer of the Year Portfolio (poy) – A POY portfolio may contain no more than 20 entries. A story or essay counts as one entry. Community Awareness Portfolio (caa) – A CAA portfolio may contain no more than 15 images TOTAL, including story or essay images. Sports Photographer of the Year Portfolio (spp) – A SPP portfolio may contain no more than 15 images TOTAL, including story or essay images. A picture can only be entered in one individual singles category. A single may be pulled from a picture story, the Community Awareness Portfolio, or the Sports Photographer of the Year Portfolio and entered in a different category. In addition, parts of a John Ahlhauser Award entry which were shot during the contest the period of eligibility (January 1 – December 31, [cgv poyyear]) are eligible for other categories. Classification is the responsibility of the entrant. Contest officials will not reclassify entries before or during the contest. All entries must be the work of only one person with the exception of The John Ahlhauser Award entries. In all categories, a minimum of three entrants must enter for the category to be judged. All entries must be uploaded by [cgv poydeadline], at noon Eastern Standard Time. All entries must be uploaded by the deadline. Deadline extensions will not be given. Late entries will not be accepted. INPA will take every precaution in handling entries, but cannot be responsible for loss, damage or non-receipt of entries. Entrants who do not follow the rules and entry procedures will be disqualified. Entries will not be reclassified or re-edited to conform to rules by the annual contest chairperson. It is the responsibility of the entrant to comply with contest rules and entry procedures. The annual contest chairperson is responsible for determining disqualifications. Entrants will be notified of disqualifications at the email address provided on the entry form. Appeals of disqualifications will be heard by INPA officers before the start of the contest judging. Disqualifications due to ethical violations will be determined by judges before the start of the contest. Ethical disqualifications cannot be appealed. The contest will have three judges as selected by the annual contest chairman. Judging is open to the public. Spectators are invited to watch and listen as the judges make their selections. Spectators must not talk to the judges or make loud comments, which could be overheard by the judges. After the entire contest judging is complete, spectators are encouraged to ask questions and discuss the category with the judges, only in general terms. Discussion of specific images should be held until all judging is complete. Individual singles and story categories: First, second, third. Photographer of the Year Portfolio: First (Photographer of the Year), second (Runner-up Photographer of the Year) and third place. Community Awareness Portfolio: First, second, third. Sports Photographer of the Year Portfolio: First, second, third. The Ahlhauser Award: First (Winner). Judges may award honorable mentions at their discretion. Category codes proceed the name of the singles, story and portfolio category descriptions below (e.g. spn, ggn). These codes will be used in the IPTC category field and as a prefix to the filename when preparing the entry for submission. Portfolio must contain pictures from at least three competition categories, one of which must be general news, spot news or news story. Portfolios will be judged on the basis of photographic excellence, subject matter, versatility, technical quality and originality. Portfolio pictures will not be broken down into individual categories by the contest chairperson. If the portfolio contains an image or story the entrant wants to enter into individual categories, the entrant must separate the images before uploading. Pictures can be arranged in any order but picture stories must be last. Each story must be proceeded by a blank/black frame. Only still pictures may be entered in Photographer of the Year Portfolio category. Each entrant is limited to only one Photographer of the Year Portfolio entry. fea – Feature: An unposed photo that celebrates life. Respect for the dignity of the subject is important. pic – Pictorial: Photo which exploits the graphic, aesthetic qualities of a subject with emphasis on composition and creativity, and a graphic image that expresses beauty, tension, harmony, chaos and other abstract concepts through composition, tonal and color relationships more than through human interaction. ppy – Portrait/Personality: A picture of a person that reveals the essence of the subject’s character. spa – Sports Action: A photograph that emphasizes the athleticism and skill of the players/participants. spf – Sports Feature: An unposed sports-related photo that celebrates the role athletics play in the lives of amateur and/or professional athletes and fans. Each entry may contain no more than 15 pictures. This includes stories: no more than 15 total pictures. All entries must have been taken between January 1 and December 31 of the contest year ([cgv poyyear]). The portfolio may contain individual photographs and/or stories and essays. At least four different sports must be represented in the portfolio. Each entrant is limited to only one Sports Photographer of the Year Portfolio entry. This award, formerly the INPA Understanding Award, is named for Dr. John Ahlhauser, a past president of the National Press Photographers Association, former staff photographer at the Milwaukee Journal, and retired professor of photojournalism at Indiana University-Bloomington. We are looking for photographs, which help us to better understand each other and ourselves. Barney (Cowherd) told me what a photographer is a man with a camera who loves people and tries to make them feel for one another. This category encourages in-depth and long-term projects, which help us to better understand each other and ourselves. The work can be compiled over a number of years, can be presented in any form, and can be a team effort. The category is loosely structured. An entry may consist of one photograph or many related photographs taken in one year or over a number of years. The work does not have to be published. Two or more photographers may work as a team on an entry. The entry may be digitized newspaper or a magazine clip, book, or whatever form the photographer feels is the best way to present his or her work. In the case of digitized clips, books, and other media where the photographer’s name appears, the name must be removed or covered. This category is separate from the rest of the INPA annual contest and has no bearing on the selection of INPA Photographer of the Year. Entries in this category will be kept intact and will not be judged in other categories. If a contestant wishes to enter a portion of his or her Ahlhauser entry in the traditional contest, he or she may do so by making and entering separate images. Please note, however, that any image or story entered in the traditional contest must adhere to the annual contest rules. All pictures in this entry are to be placed in a separate folder as specified in Article V, Sec. 4 below. Description/Caption: The photo caption. This field MUST NOT include the photographer’s name or affiliation. If a photographers name and/or affiliation is found in this field, it will result in an automatic disqualification. It is recommended that picture story entries include a paragraph explaining the package before the caption of the first photo. An introductory paragraph about the story should be included in the caption field on the first image of all picture story entries. Please put the introductory paragraph first and then the caption for the first image. This will allow more space for the intro paragraph. Try to keep it to two or three sentences. Failure to fill these fields out properly will result in an automatic disqualification. Example of IPTC fields. Click photo to enlarge. Singles must be place within this root photographers name/city initials folder. Each multiple entry (picture story or portfolio) must be inside its own folder. This folder is to be named using the above category codes, photographer’s initials, and first letter of their city. Numbering of the portfolio entries filenames must start with the first image with 01 and continue consecutively through the last image of the last picture story. 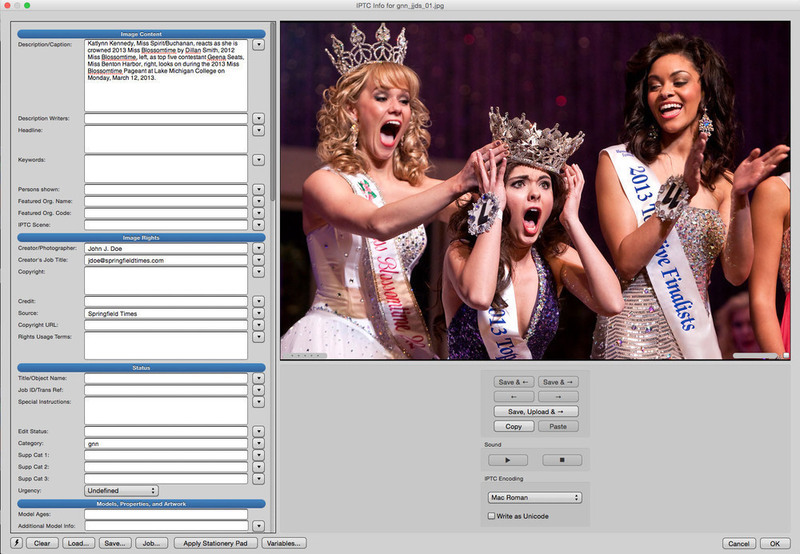 Your final entry must be saved as a zip file named with your initial+city code (e.g. 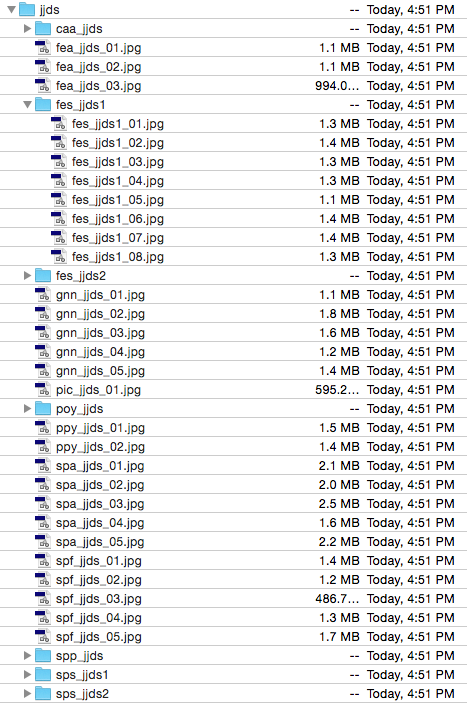 jjds.zip). This is a digital contest. All entries are uploaded via our web uploader. Click the link below to fill out the entry form, after which, you will be directed to the upload page.